Gardeners have come to rely on USDA Hardiness Zone Maps to tell us what plants will survive locally. 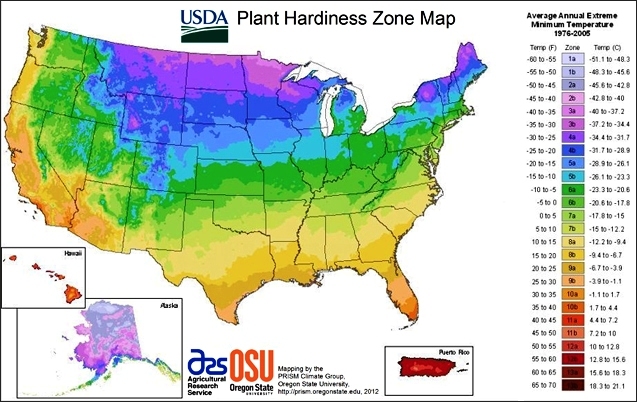 The USDA released updated Plant Hardiness Zone Maps for the United States in 2012. Plant zones are based on the average annual minimum temperature over a 30-year period, not the lowest temperature the thermometer has ever hit, but rather the average. These are guides to help a gardener determine which plants will survive in their garden . These are not steadfast rules, but rather guides to supplement other garden factors like soil quality, sun exposure, moisture and sudden or prolonged temperature swings. These combined local variables affect how well plants do. Microclimates are variations within a hardiness zone, even within the radius of a gardeners yard. Trust the knowledge gained of your property and your gardens. Hardiness Zone is good starting point as you read plant labels here at Watters Garden Center. You can download the USDA Plant Hardiness Map Site here. Appearance and Data – The resolution is noticeably better in the most recent map. Mapping was improved by using a Geographic Information System (GIS). The higher resolution makes seeing the distinction between zones clearer and easier. It also makes it possible to separate small anomalies, like cities, which tend to be warmer than surrounding areas, cooler high elevation area and areas near large bodies of water into their proper zones. The 2012 map was the first designed to be viewed via the internet. Zones can be zoomed in on a closer scale. A more sophisticated algorithm was used to compile low-temperature values from actual weather reporting stations. The zones are based on 1976–2005 weather data. The 30 year period was chosen as a means to factor in year-to-year fluctuations and variations. They did a trial check on more recent data and it did not make a measurable difference in zones. The previous map was based on 1974-1986 data. Climate Change Conclusions – Climate changes are usually based on weather averages in a 50 to 100 year period. This map uses only a 30 year average and is not meant as evidence of temperature changes. While most zones are ½ zone warmer than the previous map, the change can in part be attributed to better mapping and weather tracking. The USDA points out that some mountainous regions that had been hard to observe are now in cooler zones. Interactive Map – This link to the USDA interactive map can use a zip code input or click on the map and get your zone, actual average temperature, the temperature range for your zone and your longitude and latitude. Be careful, the map is addictive to play with. Hardiness Zone Maps Development – In the mid-1900s, the U.S. Department of Agriculture (USDA) mapped out the entire United States, Mexico and Canada by lowest annual minimum temperature groupings. Each zone represented by a 10 degree F. difference. This was invaluable advice for the agriculture industry. Now plants could be rated by hardiness zones, taking the guesswork out of choosing best plant variety. Now gardeners had a gauge other than experience for picking plants. The maps have been revised over the decades to reflect changes in climate and better measurements. When cities and towns were moved from one zone to another, gardeners were left to wonder what would happen to their existing garden plants. While our climate may be shifting, these changes did not occur over night. Plants are adaptable, surviving in many different climates. Luckily, your plants can’t read changes made in updated maps. In 1990, the zones were further divided, with each numbered zone being broken down into an ‘a’, the lower temperature end of the zone, and a ‘b’ the higher. Unfortunately, plant breeders have yet to start using these distinctions, so they are mostly useful if a gardener want’s to push the envelope a bit. A gardener in zone 6b will be tempted to dabble in 7a plants. Given the variability of climate, it’s a hit and miss situation. I simply call it gardening. The American Horticulture Society (AHS) introduced a Plant Heat-Zone Map in 1997, intended to supplement the hardiness map. Heat related problems are much harder to quantify. High summer temperatures only told half the story. Plants don’t usually react to a day or two of heat the way they might respond to a frost. However, plants subjected to a two week heat wave could well succumb. Other variables that weren’t considered were things like humidity levels, nighttime temperatures and rainfall. The South West map is shown here. You won’t get as much detail from the regional maps, but you do get a sense of microclimates and how the geography affects the zones. Within miles of each other, higher altitudes in the mountains and coastal areas of Arizona can be 2-3 zones cooler than urban and desert areas. Let’s face it, the only hardiness zone we’re usually interested in is our own. Each state has an individual map that shows the gradual changes in hardiness from one area to another. There’s this interactive map where you can click on the map and get your zone, actual average temperature, the temperature range for your zone and your longitude and latitude. And they included a Zip Code Lookup at the top of the page. Here’s the link where you can download all the individual state maps. Bottomline we are a Zone 7-8 – Central Yavapai County is a zone 7 to 8, with the ridgeline dipping to a zone 6. This means we need plants that can take the cold of winter down below 10 degrees. The entire region is the same, Chino Valley, Prescott Valley and Prescott are all the same zone. Biggest Variables occur with your direction. A north facing garden will be far colder than an east or south facing garden that see the sun more during winter. Likewise, a garden shaded by trees or that beautiful two story house will be far colder in winter than a garden that sees sun most days in winter. Biggest Mistakes are made by gardeners coming from desert or coastal gardening and not realizing how cold affects plants. Cactus brought up to the mountains from desert nurseries will thrive in the summer heat, but quickly turn to black frost damages mush as the freezing weather of winter arrive, never to live again. 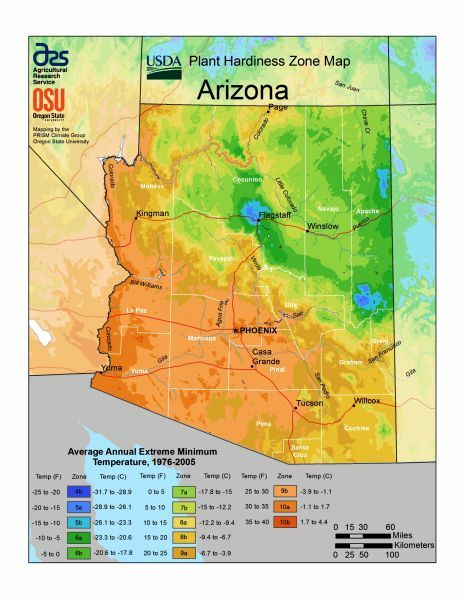 Best Hardiness Advice for Arizona mountain Gardeners – Verify you hardiness zone. As you shop plants at the garden center verify the hardiness of the plants before you buy. Plants with a lower hardiness zone or numbers will grow in your gardens. Those with higher zone numbers should be treated as annuals, they will not survive winter conditions in your garden. Stick with plants that can grow in zones 4b to 8a and they should enjoy our mountain winters. Those plants rated for 8b and higher are likely to die because of winter cold. Until next issue, I’ll see you at Watters Garden Center.